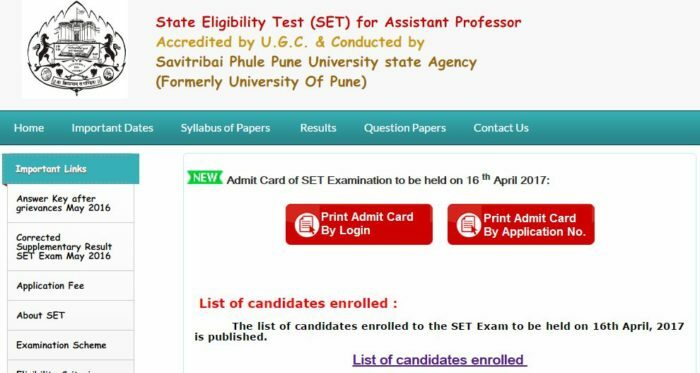 Maharashtra SET Admit Card 2017: Savitribai Phule Pune University is organizing the Maharashtra State Eligibility Test (SET) examination on 16th April across the state of Maharashtra and Goa. A huge number of competitors has enrolled for the Maharashtra SET Examination this year. All the competitors are anxious to download the MAHA SET Hall ticket 2017 as the examination date is approaching. Competitors need not worry. The Maharashtra Savitribai Phule Pune University has already released the Maharashtra SET Hall Ticket 2017 today on its official website, setexam.unipune.ac.in. Candidates can hurry up to download the admit card. Maharashtra SET Admit card 2017 is an important document to attempt the examination. Candidates will not be check-in to the examination hall without admit cards. Strict verification of hall ticket will be done at the examination center. Hence all the competitors must carry the admit cards without fail. Candidates can check the details of examination venue, timings, and date from their respective hall tickets. The details like candidate’s name, register number, date of birth, father’s name, scanned photograph, and signature will be visible on admit card. Once cross-check, all the details clearly after downloading the admit cards. Savitribai Phule Pune University annually organizes the State Eligibility Test (SET) Examination in the state of Maharashtra. The Maharashtra SET Examination will be conducted for aspirants wishing to become Assistant Professor / Lecturer in colleges of Maharashtra. The MAHA SET Examination will be conducted in 32 subjects. Candidates can choose their suitable subject and attempt the examination. The MAHA SET Exam will be conducted across 15 cities of the state. Qualifying the MAHA SET Examination with good merit is the requisite qualification to get the job as Assistant Professor/ Lecturer. Candidates qualified this examination will get the pay scale as per Union Grants Commission (UGC) Norms. Also, candidates will get good allowances along with pay scale. Aspirants applied for Maharashtra SET 2017 can check the hall ticket downloading process from here below. List of candidates enrolled: The list of candidates enrolled to the SET Exam to be held on 16th April, 2017 is published.